Smith Brothers Supports Domestic Abuse Prevention. The Network Against Domestic Abuse held their annual fundraising Purple Event on November 4, 2016 at the Hartford/Windsor Marriott that raised a record-breaking $32,000 and attracted the largest turnout in their 30+ year history. 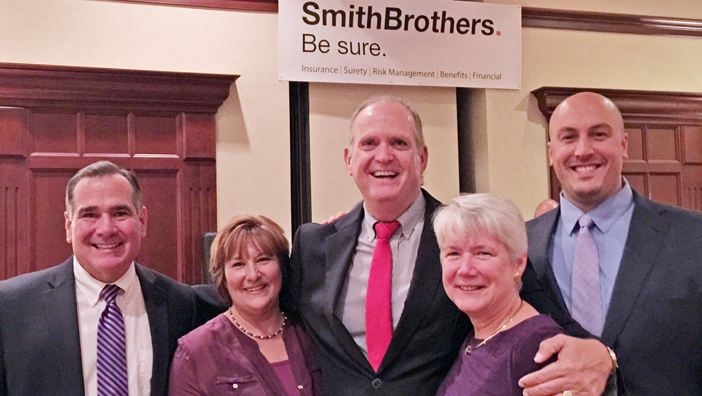 Smith Brothers was the Purple Ribbon Sponsor. Chris and Mary Howland, and Jared Carillo of Smith Brothers have a long-term commitment supporting The Network Against Domestic Abuse. Kevin Hogan, WFSB Channel 3 bureau chief, emceed the event and acted as auctioneer. The Network assists families and individuals who have experienced domestic and interpersonal violence. They also have an active education program that reaches throughout their communities and into the school systems. The Network is one of 18 domestic violence agencies in Connecticut, and leads North Central Connecticut in preventing domestic abuse and fostering healthy, violence-free relationships. Services provided by The Network Against Domestic Abuse are free of charge. The Network operates a confidential 24-hour crisis hotline, seven days a week. For more information about the Network’s services, please visit thenetworkct.org or call 860.763.7430.